I began working for Sustainable Bolivia (SB) in January, researching and writing grant proposals. This is an exciting opportunity for me because I am developing an understanding of how SB implements and manages its projects, the resources it requires, and how it quantifies success. By working directly with the Founder and key stakeholders, I am gaining invaluable field experience and insight into how an international NGO operates. SB is working on a number of projects to promote community ecotourism, resource management, environmental education and research. I am specifically applying for grants to help SB build a well to provide running water to 175 people in the San Jose community, who otherwise rely on holes in the ground for spring water. Another community is looking for funds to promote their ecotourism industry, whereby locally trained community members would provide hiking, birdwatching, and fishing excursions. All of the proceeds would be reinvested back into the community. The direct, substantial impact on the quality of human lives and surrounding environment generated by these projects motivate me to assist in securing funds. I lived with a host family when I first arrived to Riberalta. They were very kind and thoughtful. Although there was a steep language barrier, using modern technology and charades allowed us to communicate. We enjoyed watching Spanish-speaking movies together and became friends. I continue to visit them weekly, and sometimes we share dinner or watch a movie. Fellow Riberaltans are equally hospitable. When I buy produce, meat and bread in the local market, shop keepers kindly wait as I sometimes butcher my requests in Spanish. Then we share a laugh. Locals drive motorcycles, or ‘motos’ here, on dirt roads. I hope to learn how to drive one before I leave, and partake in the popular pastime of circling the main plaza several times. The SB House, where I live now, is filled by a diversity of volunteers from France, Italy, the Netherlands, Belgium and Britain. We enjoy each other’s company as we try new restaurants, explore the town, watch movies and practice Spanish. 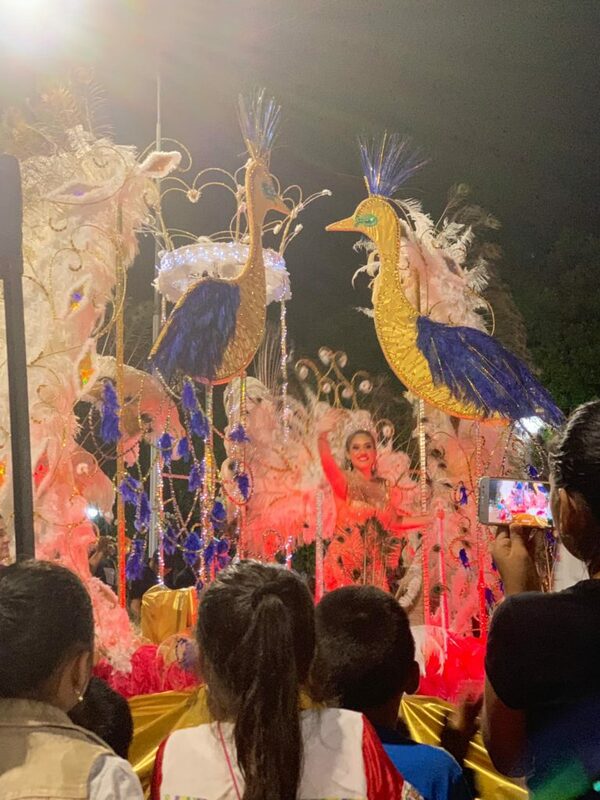 In early March we attended the Carnival Parade in town (pictured below) and were impressed by the floats and performers as they danced across the street. Last weekend a few of us went swimming in Lake Esmeralda, located 20 kilometers outside of Riberalta It was delightful to lounge in the cool water and then later enjoy beverages. I enjoy living with and learning from the other volunteers.